Consuming large amounts of vegetables is one of the simplest things you can do to improve your health. A diet rich in vegetables can help protect you from arthritis, heart disease, stroke, dementia, cancer and even help slow down the aging process of your body. Greek salad with tomato, cucumber, onion, black olives and feta cheese. A healthy Mediterranean diet dish and very easy to prepare. 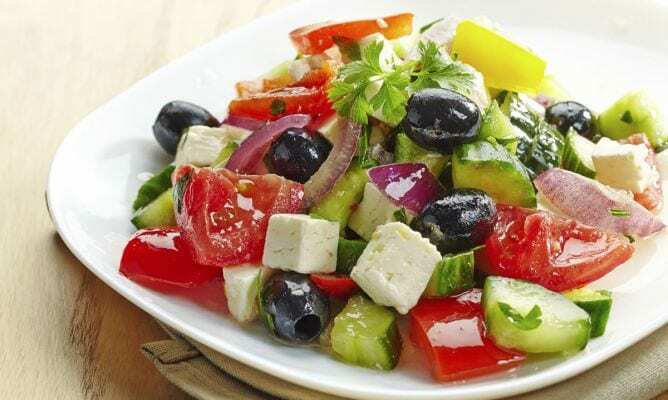 In a bowl the ingredients of the salad are added: a diced tomato, half cucumber sliced leaving a little skin, half onion peeled and chopped into pieces, black olives (the ones that are saved with the liquid to last longer ), Chopped feta cheese and some oregano. Apart, in a small bowl, prepare a simple vinaigrette to dress the salad in these proportions: a part of red wine vinegar, another three parts of olive oil, a little salt and a dash of honey to give it a sweet spot And counteract the acidity of vinegar. The vinaigrette is mixed and ready.